Fruitcake is a liquor-soaked holiday classic filled with spices and dried fruits such as apple, pear and apricot. It is often made a few weeks or even months ahead of time to allow the liquor to seep into the cake and properly blend with the other flavors. This often leads to a rather dry fruitcake, which is one reason why the dessert is not always well received. However, you can re-moisten the fruitcake before serving by adding more liquor. Poke several holes in the top and sides of the fruitcake using a skewer. 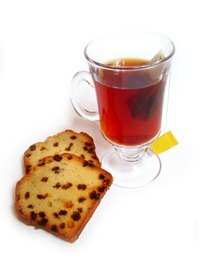 Pour ¼ cup of your choice of sherry, brandy, or rum over the fruitcake, ensuring that the liquor gets into the holes. Wrap the fruitcake in a cheesecloth soaked with the same liquor that you used. Wrap the cheesecloth-covered fruitcake in aluminum foil and place in a covered tin. Repeat the process daily for a week before serving the cake. To help prevent fruitcake from drying out, before baking, soak the fruits overnight in fruit juice or a liquor of your choice. This allows the fruits to soak up the liquid, which adds moisture to the fruitcake.